DE KEULENAER Paul, Vergeten oorlogskinderen. Het levensverhaal van de ondergedoken Joodse kinderen Regina en Georges, Brussel, 2012. Regina Sluszny, Private collection, Antwerp; Archives Service for War Victims, Brussels; State Archives of Belgium, Brussels; Kazerne Dossin, Mechelen; International Tracing Service, Bad Arolsen; other institutes. Regina Sluszny was born on 25 September 1939 in Antwerp, Belgium, as the daughter of Jacob Sluszny (born on 14 May 1906 in Biala, Poland) and his wife Jenta Gothelf (born on 10 January 1907 in Rika, Poland). Regina had two older brothers named Max Bernard alias Marcel, born on 4 November 1933 in Antwerp, and Elias called Eli, born on 8 February 1937 in Antwerp. Father Jacob Sluszny had emigrated from Poland to Belgium in 1925 to be treated for lupus, a disease which at that time was unknown in Poland. His uncle Moise Lederman found him a dermatologist in Antwerp who successfully treated Jacob’s condition. When he was cured in 1931, Jacob travelled to Poland where, on 10 November, he married Jenta Gothelf. Upon returning to Antwerp, Jacob was able to obtain a work permit as foreigners needed to live in Belgium for two years to obtain one. From then on Jacob could have a place on the markets in and around Antwerp. Only in June 1932 was his wife Jenta able to obtain a visa and travel to Belgium, where she would give birth to her three children. Regina and her brothers were raised strictly religious. When Nazi-Germany invaded Belgium on 10 May 1940, the Sluszny family was living at Kruikstraat in Antwerp. They fled to Ostend, but were not able to get onto a ship to England and therefore returned to Antwerp where Jacob Sluszny unsuccessfully continued to try and obtain visa for the Dominican Republic or the United States. As of the end of 1940, the Sluszny family was subject to the anti-Jewish decrees: registration in the Jewish Register of Belgium, expulsion from non-Jewish schools, wearing the yellow badge, membership of the Association of Jews in Belgium. After the third raid in Antwerp, on 11 and 12 September 1942, the Sluszny family went into hiding in the café of a misses Poldine in Hemiksem. Little Regina, with her blond hair, was the only one who could leave the hiding place and she was so hungry that she went out to steal cat food at courtyard of Poldine’s neighbours Charel Jacobs and Anna Van Dijck. The little girl was not accustomed to being quiet all the time so when the Sluszny family was threatened with arrest, Charel and Anna took her in and raised her as their own child until Liberation. Meanwhile Jacob, Jenta and both their sons had to change hiding places more than 15 times before the end of the war. Charel, who was probably a member of the Witte Brigade, a resistance network, found them at every address and provided them with food. After liberation, Regina was reunited with her parents and brothers. It became hard for her to adapt to the strict religious life again after living almost three years in a catholic family. After moving back in with her parents, Regina returned to Charles and Anna every weekend to live with them. Regina remained very close to the couple which treated her as their daughter and a member of their family. When Charles died in 1989 and Anna having passed away in 1987, Regina inherited the home of the couple which she still thinks of as her second parents. On 15 March 1960 Regina married Georges Suchowolski. Georges had been born in Antwerp on 4 February 1936 as the son of diamond trader Meyer Wolf alias Maurice Suchowolski (born on 6 June 1903 in Krakow, Poland) and his wife Sabina Rakower (born on 2 April 1905 in Podgorze, Poland). He had an older sister named Suzanne alias Suzy who had been born in Antwerp on 3 June 1931. The Suchowolski family was well-to-do and religious. When fleeing to France in September 1942 failed, Maurice Suchowolski decided to hide as the Sommers family on a farm near Durbuy. Subsequently, Georges and his parents were placed at the home of Joseph and Irène Draily in Chardeneux where father Maurice joined the resistance. Sister Suzanne and paternal grandparents Mordka Suchowolski and Golda Gielbwachs were hidden with another family in the same village. On 13 July 1943 the Nazis, taking revenge for the murder of a collaborator, closed off Chardeneux and started searching the houses. Although Georges, his sister and grandparents were not found, Maurice and Sabine were arrested. Neither would survive deportation from the Dossin barracks to Auschwitz-Birkenau via Transport XXII B on 20 September 1943. Georges was subsequently relocated to the home of Alexandre and Ida Collignon in Vaux-Chavanne, while Suzy and their grandparents were housed in Namur. The siblings kept in touch via letters and postcards. Only after Liberation did Georges learn that his sister and paternal grandparents had been killed when their hiding place, the Hospice d’Harscamps in Namur, was bombed by the American air force. Georges was then claimed by his maternal grandparents Joseph Rakower and Feigel Wertheimer who had survived the war by fleeing to Switzerland. 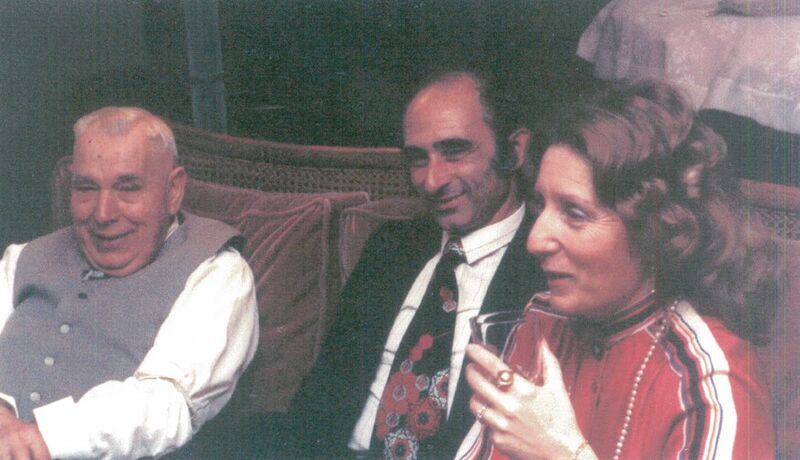 He kept in touch with Ida Collignon until her death in 1999, Alexandre having passed away in 1990, and also reconnected with Irène Draily. Regina Sluszny and Georges Suchowolski had two children and four grandchildren. Regina was an early and very active witness who continues to tell her story, most importantly to school children. She made it her mission to trace documents regarding the history of the Suchowolski and Sluszny families. She and Georges were also active members of several organisations including the Jewish Museum of Deportation and Resistance and its successor Kazerne Dossin, and L’Enfant Caché, which Regina presided for several years. In 1997 Regina and Georges obtained the title of Righteous among the nations for the Draily family, in 2010 for the Collignon family and for Charles and Anna Jacobs-Van Dijck. The Suchowolski-Sluszny family remains in contact with the children, grandchildren and great-grandchildren of the Collignon family and with the cousin of Charles and Anna Jacobs-Van Dijck. Georges Suchowolski passed away in 2016. Regina Sluszny started researching the history of the Suchowolski and Sluszny families in the 1990s. In 2011 she kindly permitted Kazerne Dossin to digitise her research collection.